Taramosalata — FOOD OF THE GODS! And man, I am addicted to this stuff! I was introduced to it several years ago by close friends. I loved it then, but could never remember what the heck it was called (not exactly an intuitive name)! Finally, I was shopping at Whole Foods Market one day and saw this jar. Bingo! That’s the stuff! 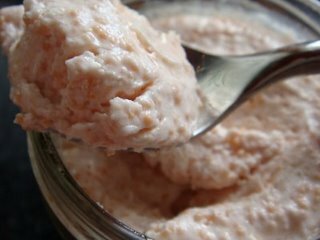 Taramosalata is a Greek or Turkish spread made from salted and cured Carp roe (also known as taramas) and blended with lemon juice, canola oil and sometimes a thickener, such as mashed potatoes or food processed white bread. This version is just the fermented roe, lemon juice and oil… and has 6 grams of fat in ONE tablespoon! Like I said… not good if you are on a diet… but OH so worth it if you feel like splurging. If you like caviar and you like mayonnaise, you will like this spread. 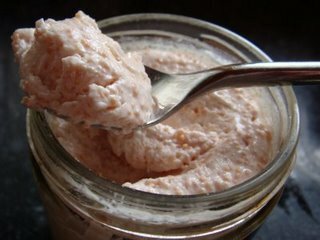 Taramosalata can be used as a dip for fresh vegetables or can be served on torn bread or crackers. My favorite way to eat it is smeared on a piece of crusty, rustic dipping bread. It is salty, creamy, rich and delicately flavored by the cured roe. The taste is not quite as overpowering as caviar straight up… it’s a much smoother finish. Unlike traditional caviar, the roe seems to be a bit “softer”, rather than the firmer, “popping” flesh most caviar has. It’s not super easy to find. I’m sure you can find it in any Greek or Mediterranean specialty market, but at your local Stop and Shop or Shaw’s — it’s nowhere to be found. I have purchased it at Whole Foods Market. I have found it in the small refrigerator case that runs the length of the seafood counter. At Russo’s market, it is to the left (when you first walk in), on one of the upper shelves above the fresh mozzarella and ricotta. If all else fails, you can buy it on Amazon.com! 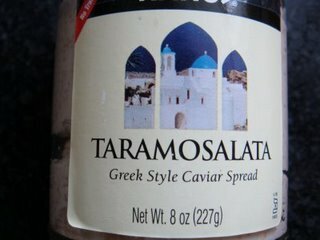 Another food blogging friend of mine summed it up quite nice… he said to me “Taramosalta is to the Greeks what Lox spread is to the Jews.” A delicious staple to feed your hungry soul!